The documentary sketches the history of the American hobo, from his roots in the Civil War through the Westward expansion of the nation, to the hardscrabble times of the Great Depression and beyond. We learn the origin of the name, “hobo,” and discover how the act of hitching a freight train developed into an American phenomenon. But the heart of the film is the vivid commentary from actual hobos, all of whom have colorful road names, such as Santa Fe Bob, Connecticut Shorty, Side Door Pullman Kid, and Captain Dingo the Airborne Hobo. Country music legend, Merle Haggard, and acclaimed author, James Michener, also make an appearance, sharing their own accounts of life on the rails. So what drives them? There is no single explanation. These hobos testify to a variety of motives – independence, adventure, thrill, escape, a test of survival, the lure of constant motion, the beauty of the land. 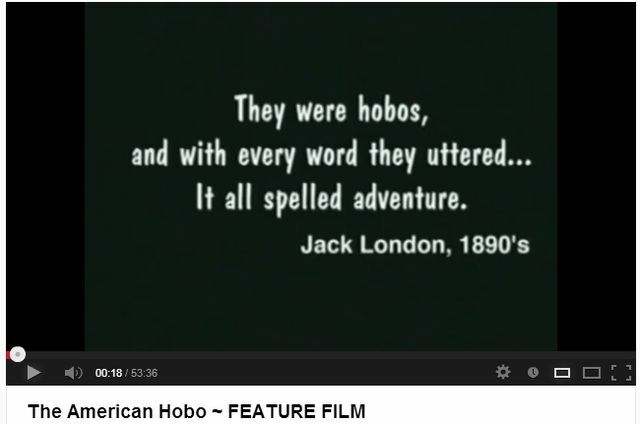 … Whatever the impulse, the life of a hobo has charm and possibilities for greater personal freedom. But one should not assume that hobos are isolated loners. The film carefully illustrates the distinctive sense of community shared by these freight travelers. An annual poetry and music festival, sponsored by the National Hobo Association, highlights the vibrant culture and solidarity among hobos. Indeed, the film teaches us that freight trains, more than mere objects of transport, are also conductors of creativity for those who wish to hop on. The documentary is enhanced by a colorful soundtrack with captivating folk songs that speak to the hobo spirit in us all. And although modern times have cast doubt on the future of the American hobo, the film maintains hope that, as long as rails exist and there are places to escape from, the hobo will always be with us. This is a poem I wrote a couple yrs ago, it's basically the same theme. Hope you enjoy. It has been published. Here comes the Nine O Five, right on time, big wheels click clackin’ down the track. Now she’s rollin’ fast on the straight, with sparks flyin’ high into the ebon night air. She slows when she hits the bend just over the river. It’s a pretty sight watchin’ pure white puffin’ from her stack. without a swerve. Her huge engine gleemin’ under the low crescent moon. all gettin’ up off the sooty grass. to make their death defyin’ leap to new life. but they’ll be tryin’ again tomorrow night for sure. knowin’ it will be the Nine O Five. I listen for it’s metal song, the click, clackin’ song of freedom of those rollin’ wheels. soon, tomorrow night or next week maybe. of ungoverned men, but that’s all right. We like it that way. their lonely melody down them tracks. alabaster independence flying it’s tail through the pure, cool black air. worker (off work about 18/19) showed me how. was about 3/400 yds from the rail and also off a spur to Large Roundhouse. for the turn onto the bridge. This was in the late 40s and it's all gone now. I wish I had photos of that today. I rode the rails as a child, The CandO, BandO and others I hardly remember, the thrill of the Steam Trains and Parlor Car in the 1950s with my Mother, several trips from Virginia to Atlanta, a trip from Virginia to Miami in 1957 then a plane to La Habana to visit my Uncle who worked for Bacardi, I was too young then to drink Rum or go to the Casinos at night so I was entrusted in La Habana to a babysitter from American United Methodist Ladies..., when I was 14 I was allowed to go by Bus and Trains myself from Richmond, Virginia via New york to Bangor, Maine where a relative picked me up. The last train trip with my Mom, then with Diesel engine on the "Chessie" or CandO was to see MLK speak in 1963, on the way back through Virginia the Black Americans rode in their own Coach... Then I began Hitchiking all over the USA and Canada when I became old enough to leave home....Yes I did work for a year, two, three and all I could think of was HITTING THE ROAD. I am fond of the Johnny Cash song about trains, where he sang at Folsom Prison, "I hear that train a coming." I've had my moments in life. Not as many as I would like to have had but then there's still time for a few more. I agree that it would be great to have a better passenger train system in the USA. It was good up to the late 60s. My last main ride was Topeka to Chicago then Detroit. Had a party on the Chi ride with a bunch of college students going home for Thanksgiving. The best trains now are in Europe, still have a lot of the old charm and Japan's good but way to crowded most of the time.